During the very early years of our marriage, money was often tight. It was always especially tight around Christmas. One year, we bought the smallest of gifts for our older kids and wrapped a couple of “bottom of the toy box“ toys for our youngest boys to open on Christmas morning. They had no idea that the toys were ones that we already had! That particular year it didn’t look like we would be buying a Christmas tree, but on Christmas Eve my husband came home with a $15 bargain tree. It was the only Christmas gift from my husband to me. It was very special because it was my heart‘s desire. I think that it was probably the one gift I remember most some twenty-five years later. 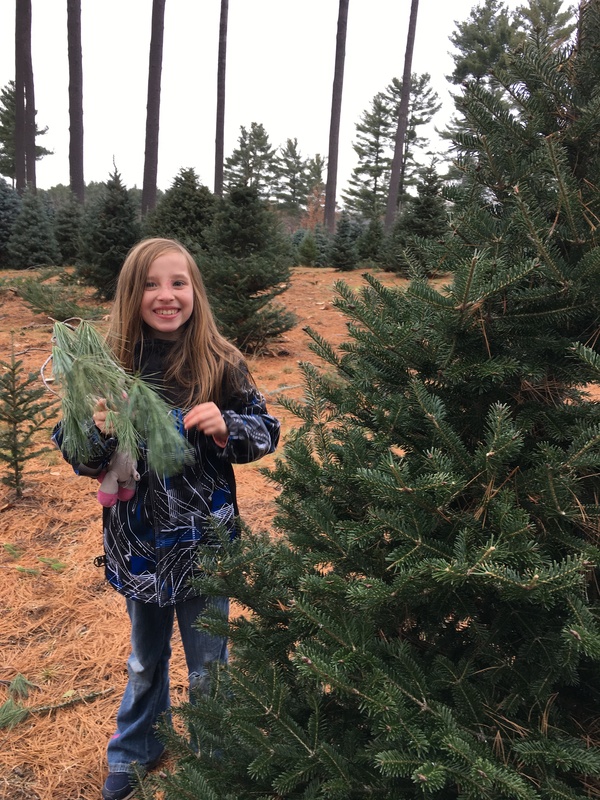 Picking a Christmas tree has now become a family tradition and a big event. It’s even become more exciting than when the kids were little. 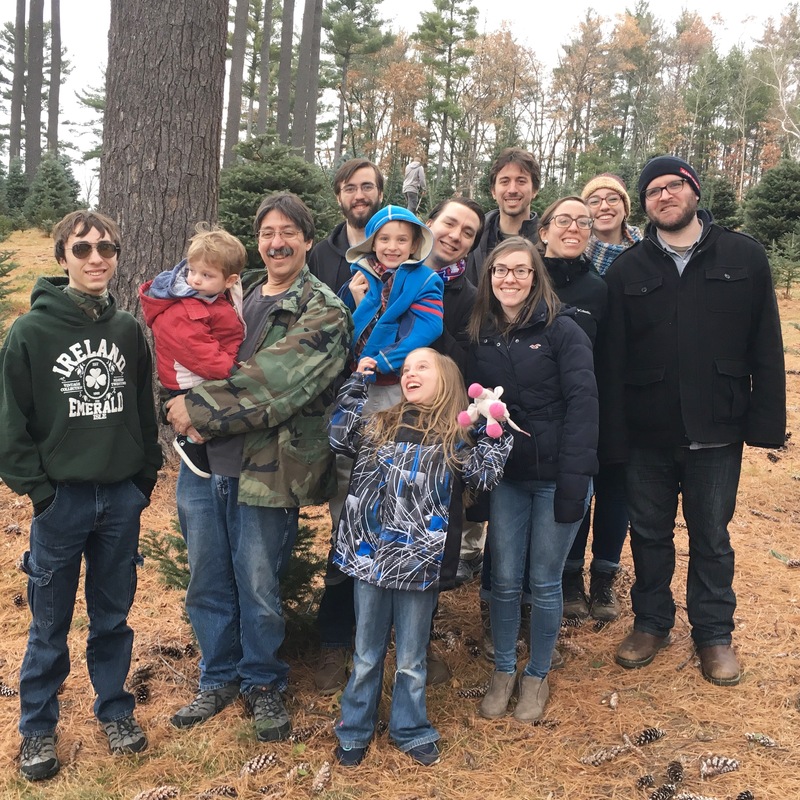 For the past five years or so we’ve all headed together to Rollie’s Christmas Tree Farm in Lowell, MA, and picked out fresh trees. We took a group picture this year. One of my daughters wasn’t able to join us because she had to study (she’s too studious! ), and I wasn’t in the picture because I was the one who took it! Rollie’s has a tractor and trailer that we all pile into (it takes two tractors to bring us all) and we ride to the top of the hill to pick out trees. Our oldest three kids are married so they pick trees for their homes; and my husband and I and our kids who still live at home, pick out one for our house. My granddaughter Amelia found a tree that she wanted. The friendly Rollie’s Farm guys cut the trees that are picked, and we pile them back into the tractors and head back down the hill to pay. 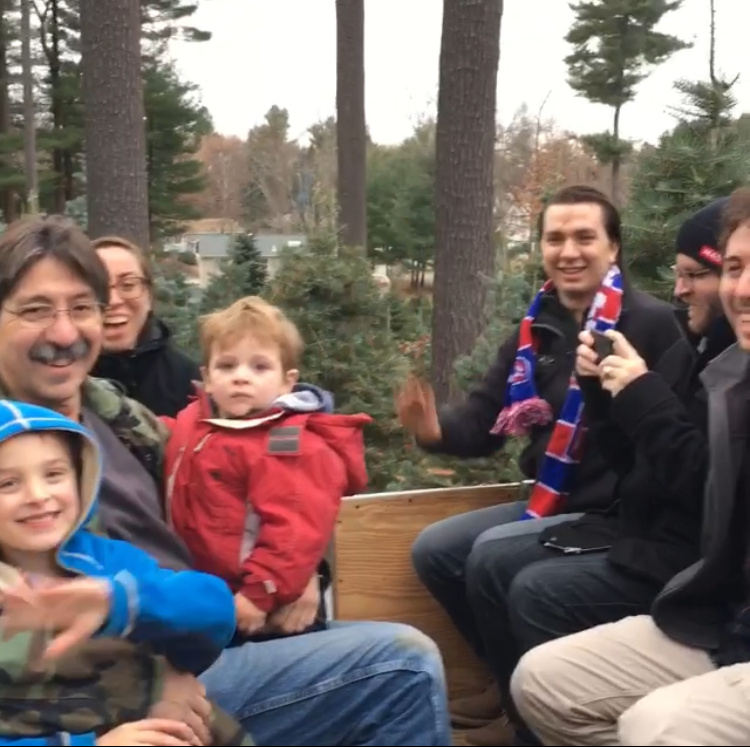 This year my sons with pickup trucks delivered our trees to the appropriate homes and then everyone converged on our house like a flash mob and we all had hot tea and cocoa. One year when our youngest two boys were about four and six, I came home from the supermarket with a little potted tabletop rosemary bush shaped like a tiny Christmas tree. I jokingly told the boys that it was our Christmas tree this year. They both started crying (which makes me chuckle now), but they were so disappointed! I reassured them that it wouldn’t be our Christmas tree! Picking out a real tree was something important to them even at that age. 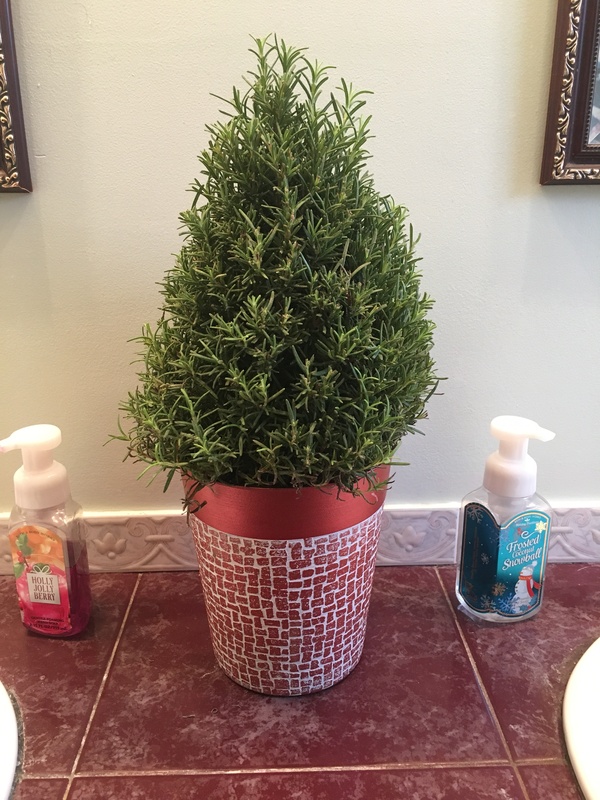 This year I found another little rosemary Christmas tree. It’s too late to trick my grandchildren with it! There’s something about our Christmas tree that is so special to me. 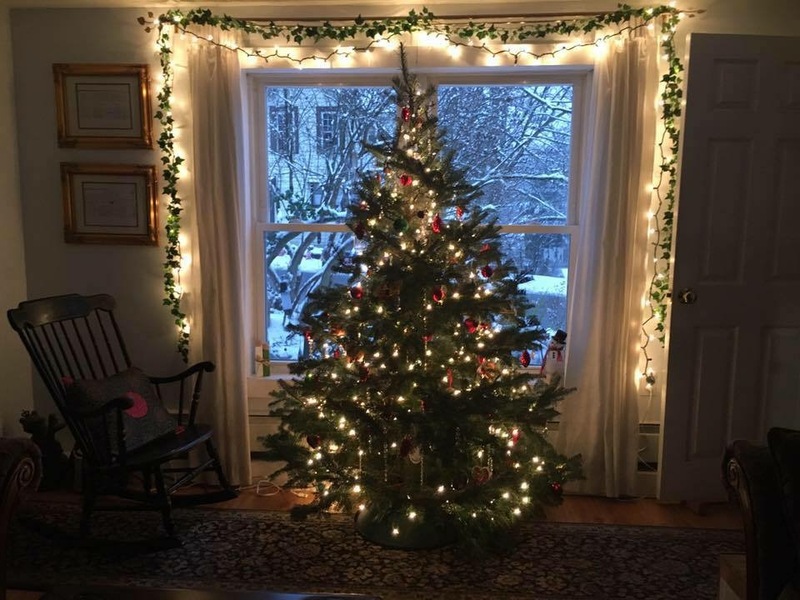 I love the beauty of the lights, the peacefulness my tree emits into the surroundings, the memories of loved ones it recalls in the forms of the various ornaments both made and received as gifts over the years, and the fresh smell of pine that evokes memories of past Christmases. My tree will always be my favorite gift of the year. This year may you experience Hope, Joy, and Peace, which is the true meaning of Christmas.